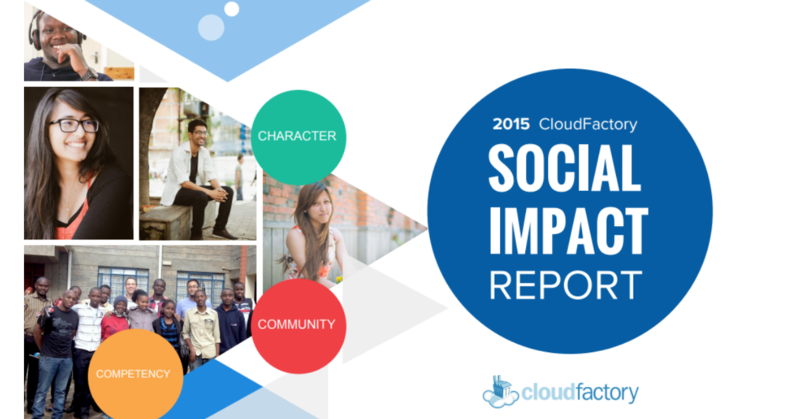 Check out our first annual Social Impact Report! Learn more about the people behind our workforce and the impact we’re striving to make in the developing world. 2015 was a big year for CloudFactory, and 2016 is shaping up to be even bigger! What does that mean exactly? Well, we measure our success a little differently than a lot of other businesses. As a fast-growing, tech-driven company we’re maniacally focused on wowing our customers by being an indispensable partner as they grow and scale. At the same time, we’re fundamentally driven by our social mission of connecting 1 million people in the developing world to meaningful, online work while raising them up as leaders to address poverty in their own communities. Having two bottom lines helps keep us focused on the two things that matter most to our success...the success of our customers and developing leaders for our growing workforce! At CloudFactory, we believe that talent is equally distributed around the world, but opportunity is not. We want to change that! As a leader in the Impact Sourcing movement, CloudFactory invests heavily into our workforce, helping them uncover new talent and develop critical skills while providing them with the opportunity to serve their communities. Our talented,trained and privately managed workforce is what truly sets CloudFactory apart when it comes to getting high-quality work done. In our first annual Impact Report, you’ll find out lots of interesting facts about the impact CloudFactory is making in Nepal and Kenya, in partnership with our rapidly growing customer base. Download the social impact report to learn more! We’re incredibly humbled, grateful and excited to continue on our journey of connecting 1 million people in the developing world to meaningful, online work. Stay tuned for much more!